Posted on December 18, 2014 by Who Said That? One of the best things about living in a small town is that we are all in this together. Our little paper is the go-to for the goings-on in the Valley. I love reading my friend’s weekly column, the results of our high school football games (generally not that great), updates on local politics, where to go for yoga and when Santa will be in town. Thank you, Vail Daily, for continuing to publish my silly thoughts. 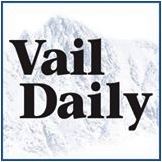 Vail Daily column: The goose is getting fat | VailDaily.com. This entry was posted in Life and tagged Colorado, It Takes a Village, Newspaper, Small Towns, Thanks, The Vail Daily, Vail by Who Said That?. Bookmark the permalink.